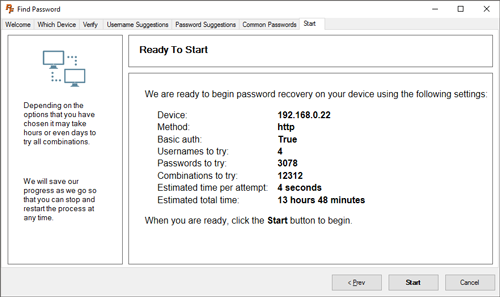 The Find Password App is intended to help recover lost or forgotten router passwords. It can automate the process of recovering lost or forgotten router passwords on your home network. This can be useful in preventing the desperate act of doing a full router reset just to get logged in. It's also capable of finding lost passwords on many other internet connected devices such as security cameras, IOT devices, DVR's, and just about anything with a web interface. In order to prevent illegal activity The Find Password App is limited to only working on devices on your local area network. It will not work over the internet. The most common scenario of when you would need to crack your router's password is if you have changed the default password and then forgotten what you changed it to. Usually in this case the only other course of action that you can take is to do a factory reset on your router. The problem with factory resetting a routers is that you will lose all of your settings. If your ISP has made specific settings in your router this can be a pretty big deal. Getting your router back up and operating normally can be quite a challenge, especially considering you will not have the internet working. Another common situation is when you do not know the default factory password on your router. There are not that many default factory passwords, but trying them all manually can take a long time. The Router Password App is able to try all of the default router passwords pretty fast and then report back which one worked. Let the app find your router on your network and figure out how to best talk to it. Tell the app which passwords of your own to try. Tell the app which lists of common passwords to try. Let it go to work trying all the combinations. It might take some time to try large lists of passwords. In our tests most passwords take about 2 seconds each on a pretty average Linksys router and about 4 seconds on a modern Netgear. If you want to try all character combinations of the word "password" (such as p@ssword, p@$word, passw0rd) you'll be waiting about 14 hours while the Find Password App tries roughly 12,000 combinations. However, waiting 14 hours is a much better solution than factory resetting your router and possibly being off the internet while trying to figure out how to get it back online. Determine if your router uses Basic Authentication or some sort of custom form submission. Tries each username / password combination on your router one after the other. Looks for a page to come back that looks significantly different. Prompts you to check if you are logged in or not. When we started this project we were amazed at the variety of ways that router's work. Some router's are very "normal" in that they simply present a standard web login prompt, while others have all sorts of fancy web forms to submit. Even more diverse is the way that routers handle success or failure of login. This was the hardest part of creating the Find Password App, and is still the hardest part about maintaining it. 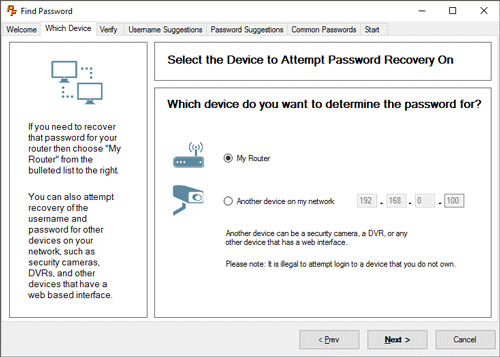 There is a very popular router password kracker application out there (yes, it's spelled with a k) that does a great job of attempting to login to routers and recover their password. And it's free! It's a very well made application and we do not intend to disparage them in any way. The problem with that app is it is very limited in what types of routers it works with. It handles Basic / Digest authentication beautifully, but in our testing it's not really capable of dealing with the variety of custom form submissions out there. In addition it has a very hard time determining when it is done because routers are so diverse in how they handle good vs. bad login. I was not able to get it to recover a password in any of the 4 routers I through it at. I'm sure it works great for many routers, just not mine. One other thing that Find Password does is what we call Advanced Password Generator. What this is is the way try to guess similar passwords to yours in case you've used some advanced character substitutions in your password. 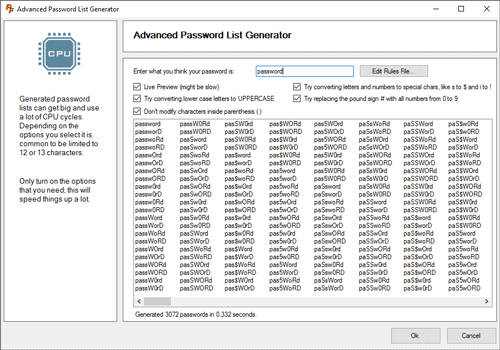 If you want to read more about the Advanced Password Generator part of Find Password we've got more info about it here. The Find Password App is just one of many tools in the Network Utilities suite of applications by Portforward. Some of the tools are free and some of them are not. Find Password is one of the tools that you have to pay for, along with Router Login and PfConfig, an application for setting up port forwards in your router.